Listening to the Wisdom of Horses. Based In Humptulips, WA 98552. Felisa travels across the country sharing this amazing personal growth work. Do you want to get alignment with your purpose, passion, and truth? Do you want to know who you are, how to get in touch with your deepest truth, the truth of your heart and soul? Do you understand your communication and leadership style? Would you like to create better relationships in your life? Through facilitated interactive exercises with the horses, you have an opportunity to get in touch with your true nature, find clarity, heal old stories and traumas that limit us in life and discovering and living our life’s purpose. Horses have an amazing ability to feel into your heart and soul and help you see your truth, your souls’ purpose and to embrace the life you were put on this earth to live. They can show you what is in the way and what has been buried deep within your heart and everything that is in the way of living your greatest life purpose, have better communication in your life. No Prior Horse experience necessary. 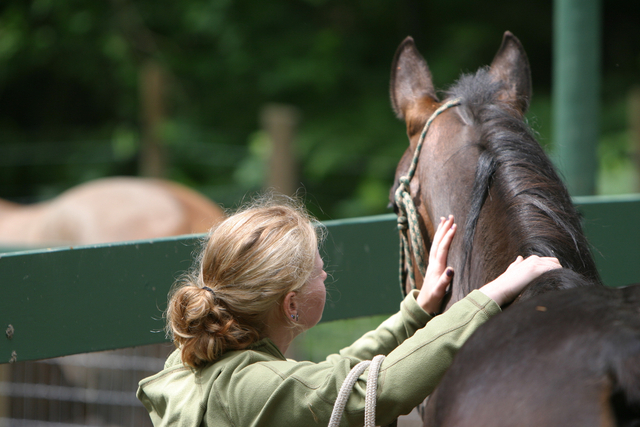 Enhance your Natural Horsemanship abilities where Horses get to be your teacher. Felisa Holmberg, a Rolfer of Structural Integration and your Equine Facilitator, is experienced in the personal journey each of us face and facilitating this unique work with horses to provide the change you need. EGE is the novel approach of utilizing the acceptance, empathic understanding, animal instincts and intuition of horses to provide a safe, yet honest, reflection of yourself in life frequently resulting in new horizons and abilities. Equine Guided Education “EGE” is a facilitated experiential learning process where the horse becomes the teacher, a mirror for you to gain profound insights into your heart, developing your intuition while helping you find your individual truth.